The Ministry of Sports will on Tuesday learn how much of the Sh4.2bn budget allocated by Cabinet for the African Nations Championship will be slashed. Hassan Wario, the Sports Cabinet Secretary on Tuesday appeared at the Parliamentary Committee scrutinizing the Supplementary Estimates under which cabinet approved the CHAN budget. However, the Cabinet Secretary who has been largely missing from the public radar for a while could not substantiate why the ministry still needs the entire amount with Kenya stripped of its hosting rights for CHAN. This comes barely a fortnight after his Principal Secretary Peter Kaberia assured that the money allocated will not be returned to the government coffers. From the sitting in Parliament on Thursday, almost Sh3bn will be slashed off the budget. Amongst the biggest amount to be slashed from the budget will be some Sh1.6bn allocated for stadium access control and lighting as well as Sh603mn meant for grass. The Member of Parliament argued that since those were primary requirements for CHAN, it wasn’t a must that the allocation remains and instead the money should be allocated to ‘more urgent government matters’. At the same time, Sh873mn initially budgeted for the Kenyatta Stadium in Machakos could be returned due to a conflict with Machakos County boss Alfred Mutua. Wario told the Parliamentary Committee that Mutua switched lanes, saying he prefers construction of a stadium elsewhere and not Kenyatta according to the initial contract. “The contract for Machakos is on hold, because when we advertised for the main Machakos Stadium and there was a contractor who was engaged to undertake the work there but later the Governor of Machakos changed the venue so we said the contract was signed for a certain venue once you change it the contract changes,” Wario told the committee. At the end, the ministry could remain with only cash set out for construction while losing a huge part, making out quality playing surfaces. There are mixed signals with allegations that the money recalled was meantb for marketing and publicity. In yet another slap on the face for his ministry, Wario failed to put up a case for Sports in the country, a sector heavily hit with below par competition and training facilities. If the Parliamentary Committee slashes this amount, then Kenya’s hope of bidding for either the FIFA U17 or U20 World Cup next year will remain a dream. 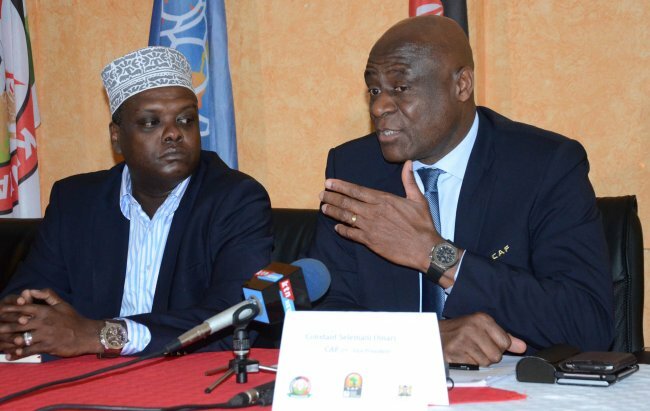 After CAF took away CHAN, Nick Mwendwa said that the continental football body promised to back Kenya’s bid to host one of the events as the CHAN stadia will have been completed. However, that now seems to be more of a pipe dream with nearly three quarters of the budget set to be plucked off. The hosting is not guaranteed because there is a bid process more stringent than CAF's. Meanwhile, the Football Kenya Federation is keeping its chase on ensuring the country hosts this year’s CECAFA Senior Challenge Cup. The CECAFA governing council last week gave Kenya the hosting rights after last year’s tournament went up in smoke. Nick Mwendwa, the FKF boss had a meeting with Kakamega Governor Wycliffe Oparanya early this week as he sought to know whether Bukhungu Stadium’s construction would be done in time for the November tournament. Barry Otieno, the FKF communication director told Sports News Arena that the protraction is to host CECAFA in Kakamega, Kisumu and Nakuru. At the same time, the federation has announced Kenya will not field a team for the FIFA Women’s Under-17 World Cup Qualifiers. The junior Harambee Starlets were scheduled to play Ethiopia in the first round of qualification on October 13. The federation through Secretary General Robert Muthomi said Kenya would not be able to raise a competent team for the qualifiers as most of the players would be busy with their KCSE Examinations. “Following consultations with the schools and Ministry of Education officials, we have decided to withdraw our participation to allow players ample time to prepare and sit for their exams, which we also find crucial for their development,” Muthomi noted. Kenya will now fully focus on the Under-20 World Cup qualifiers with Kenya set to play against Ghana in the third qualification round on November 3 in Accra before playing the return leg a fortnight later in Machakos.